Malorie Reimer is an International Ambassador at the International Degree and Education Abroad (IDEA) office. She is currently studying Environmental Economics and Policy and Business and Entrepreneurship. As a native Canadian, Malorie gives an unique insight to the differences in the American and Canadian culture. Right above United States of America, on the world’s longest land border, is an enormous country full of rich culture. Although it is the second largest country on the planet, Canada is often referred to as the upper half, or ‘Hat’, to The United States. Even though it is nearby, there are many differences between the two nations that are interesting to learn about. Fun Fact: Canada has the 4th lowest population density in the world. An average of roughly 3 people live in one square kilometer. Before traveling to Canada, here are a few quick facts to start you out and help you learn about this diverse and wonderful country. Poutine: A French Canadian Dish including fries smothered with cheese and hot brown gravy. Smarties: Instead of the American Smarties that are a small powdery sugar candy, Smarties in Canada are like flatter M&M’s. 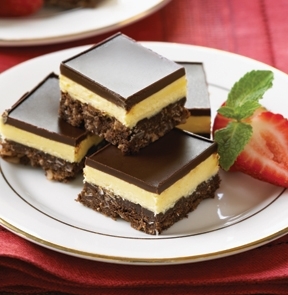 Nanaimo Bar: A dessert square that requires no baking. It contains three layers of deliciousness. The base is a chocolaty, wafer crumb layer topped by a layer of light vanilla or custard flavored butter icing and topped with melted chocolate. Ketchup Chips: Possibly the most popular flavor of potato chips in Canada. Ketchup chips are a must try. 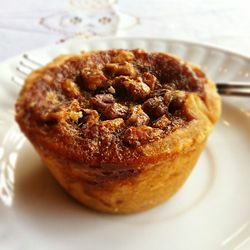 Butter Tarts: Like a mini American Pecan pie but without the nut topping. They consist of a sugar, syrup, and egg filling all within a pastry shell. Sometimes raisins are added in. Timbits: These are essentially donut holes that are bought from Tim Horton’s that come in a variety of flavors. Posted in College of Business, Uncategorized.